This tour is an excellent choice for people who want to enjoy spectacular scenery at the Mpumalanga Panorama Route, combined with game drives to see the renowned Big Five (elephant, rhinoceros, lion, leopard, and buffalo) and stay in comfortable accommodations when nighttime comes. Main wildlife to be viewed: Big Five: elephant, rhinoceros, lion, leopard, and buffalo. Children policy: Children from 1 year old and above are welcome to join but no children under six are allowed at the sunset game drive. This safari must be booked at least 60 days in advance. Features: Air-conditioned bedroom, bathroom with bath, shower, and toilet, fully equipped Kitchen with a 2-plate stove (no oven) and microwave. Lounge with TV. Breakfast Nook. Carport and BBQ area. Your second night will be at Letaba or Satara Rest Camp in Kruger National Park. You will begin the journey at a centrally located spot in Gauteng and drive through some of the most scenic areas of the Eastern part of South Africa. You will visit the intriguing museums and shops in Pilgrim’s Rest and then drive to view Pinnacle Rock and then to experience the amazing view from God’s Window. You will then visit the Berlin Falls, where numerous local arts and crafts are for sale. From here, you will visit Bourke’s Luck Potholes for lunch, and then head the Blyde River Canyon, where you will overnight in a chalet at the resort: Forever Blyde Canyon (or similar). Dinner at the restaurant. You will leave after breakfast to take a boat trip on the Blyde Dam. An interpretation tour will take you to the Kadishi Tufa waterfall and the Three Rondawels. An abundance of wildlife will keep you distracted while learning more about the natural history of the Blyde Canyon. The Kadishi Tufa waterfall, at 200 meters (around 660 feet) in height, is the second tallest Tufa Waterfall on earth. The waterfall’s formation strikingly resembles a face which is crying profusely, and is thus sometimes known as ‘the weeping face of nature’. The Satara Rest Camp is situated in an excellent game viewing area, with the bush relatively open and the animals plentiful and diverse. The camp itself has a rustic charm, with the bulk of the accommodation set out in a series of circles. Satara is well wooded and the bird-life is prolific. At night the clink of fruit bats is fused with the chirping of cicadas and crickets. The calls of owls and night-jars add to the symphony that is punctuated intermittently by the whoop of hyenas, the screech of jackals and the roars of lions. 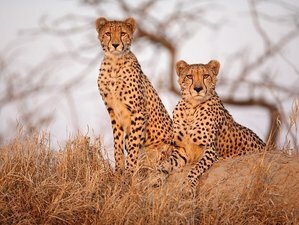 Enjoy a Sunset Game Drive which transitions into the night where you can see the nocturnal activities of Kruger's secretive creatures and lasts at least 3 hours. Dinner at the restaurant follows. Overnight in a bungalow or cottage at the Satara Rest Camp, or similar. (Brunch en-route for own cost, restaurants available) After a 140-kilometer game drive, you will return back to Johannesburg via Nelspruit (Mbombela). This safari will start from Gauteng and will take you to Kadishi Tufa Waterfall, Letaba, and Kruger National Park, in South Africa. Kruger National Park was proclaimed in 1898 and later extended to its present size of approximately 19,000 square kilometers or 8,000 square miles. Where nearly two million hectares of the unrivaled diversity of life forms fuses with historical and archaeological sites - this is real Africa. The world-renowned Kruger National Park offers a wildlife experience that ranks with the best in Africa. This tour is an excellent choice for people who want to enjoy spectacular scenery, combined with game drives to see the renowned Big Five (elephant, rhinoceros, lion, leopard and buffalo). Daily breakfasts are included in the price. Other meals will be enjoyed at excellent restaurants. Please book your flight to arrive at OR Tambo International Airport (JNB). Transfer from and to the airport is included. Amatungulu Tours will pick you up from the airport between 6 a.m. and 6:30 am. They can also pick you up from Gautrain Centurion Station or your centrally located hotel between 6 a.m. and 6:30 am. Airport: O. R. Tambo International Airport Airport transfer included: O. R. Tambo International Airport No additional charges. You can request this in the next step. A reservation requires a deposit of 40% of the total price. The rest of the payment should be paid 60 days before arrival. Amatungulu Tours is a trusted tour company providing safari tours to explore the amazing wild areas and fascinating historical sites in South Africa. Book at least 60 days in advance. Shared various accommodations - Only bookable if 2 other bookings exist. For this organizer you can guarantee your booking through BookAllSafaris.com. All major credit cards supported. I would like to receive the BookAllSafaris email newsletter, including special Safari Holidays offers and giveaways. Show this Safari Holiday to your friends.